Is it Blackrain, Black Rain, or BlackRain? I’ve seen it listed all three ways (their Facebook and MySpace pages seem to conflict!). I discovered this band last year thanks to someone posting a YouTube link to their music video for “Innocent Rosie”. I was immediately hooked. It’s one of the greatest sleaze songs ever written. No hyperbole. The song is a gigantic hammer that bashes you in the face! So after over a year of being aware of this album why did I just now get it? It’s those darn import prices! They always rear their ugly heads! I’m sorry, I just can’t bring myself to spend $25-35 for one CD. If I’m spending that much, it better be a double disc super duper deluxe edition with a t-shirt and something autographed or a box set. There’s a market for ’80s inspired rock/metal like this all over the world– I just wish these bands, labels, distributors, whoever would make the music more financially accessible for the fans. 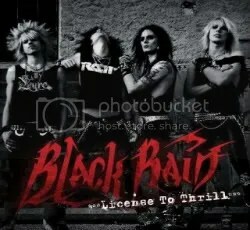 Anyway, Black Rain are a sleaze band from… wait for it… FRANCE! Yep. No Swedish or Finnish sleazers here. They come across as one of the more powerful sleaze metal acts around today and that’s definitely helped by the fantastic shrill ‘n’ sleazy vocals of Swan. Just listen to “Innocent Rosie” to hear an amazing vocal performance. The whole album is a great collection of party metal, featuring the sexed-up lyrics that I’ve come to love from this scene, but typically, the band also has to slow it down for a ballad or two. “No Forever” is a good power ballad as is the band’s cover of the Burt Bacharach-penned “Baby It’s You”, which was originally performed by the Shirelles, then the Beatles, Smith, the Carpenters and even Ace Frehley (another interesting take but I don’t think it ever got past the demo stage)! “Baby It’s You” is another tune where Swan gives a great vocal performance and is only present on the 2009 reissue. I’ve said before that I think the current sleaze/glam scene is a bit crowded and I’ve grown weary of many bands that have the looks but don’t the hooks but Black Rain is one of the standouts in that community right now.